I felt like that today. I showed property in the rain, shopped for and bought plants and flowers in the rain, unloaded those plants and flowers in the rain, arrived for Zumba class and left Zumba class in the rain, and fed and cared for my friend’s pets, whiles she’s away on vacation, in the rain. I got wet several times today….soaked. I changed clothes twice. Fixed my hair multiple times. I could fuss, complain or resist the rain. I could wish it wasn’t raining. The reality is, it rained today. It’s been raining, at least a little bit, every day for the past week or so. And it’s going to rain tomorrow. I decided today, for my first, to make friends with the rain. 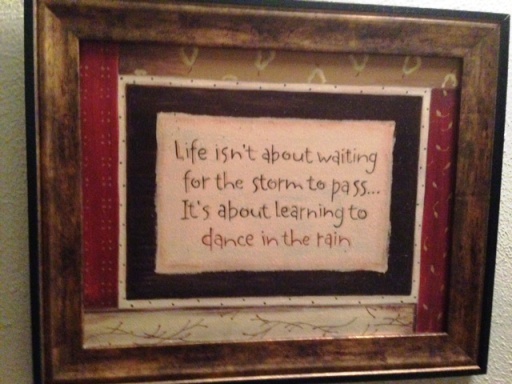 Several years ago, I received a framed print that reads, “Life isn’t about waiting for the storm to pass, it’s about learning to dance in the rain.” I’ve come to appreciate that truth more and more. To wait out a situation, helplessly, is to take myself out of the flow of life. It puts me in victim mode. To accept a situation is to accept the reality of what is, and creates peace in my heart and in my world. I may not be able to change the situation, but I can change the way I perceive it and respond to it. I can, indeed, dance. The rain today, was just rain. Yes, I had to be out in it. However, I could find reasons to be grateful for the rain: We need the moisture, since my region is behind the average rain fall amount for the year. The newly planted areas of my garden are benefitting greatly from this long drink of water. I have not had to water my garden myself! These are rain showers, for the most part, rather than severe thunderstorms, yesterday’s tempest not included. No real damage from that storm. Unlike a well known character in a place called Oz, I don’t melt when doused with water. The rain cleanses the air. The rain has a beauty and musical sound all its own. I was virtually alone as I shopped for plants and flowers at Lowe’s, as others seemed to choose to stay inside, and I was able to get a great selection at great sale prices. 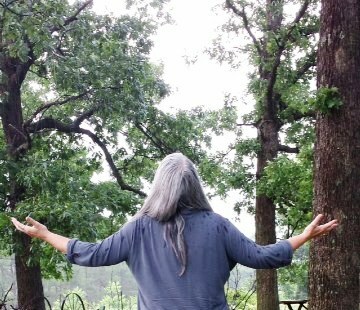 I sang and laughed in the rain as I unloaded the plants from the truck. And that’s when I realized I had, indeed, made friends with the rain. I welcomed it. Greg drove me to my friend’s house so I could care for her pets, and as we arrived, another downpour began. It was the perfect moment to capture my relationship with the rain with a pic. 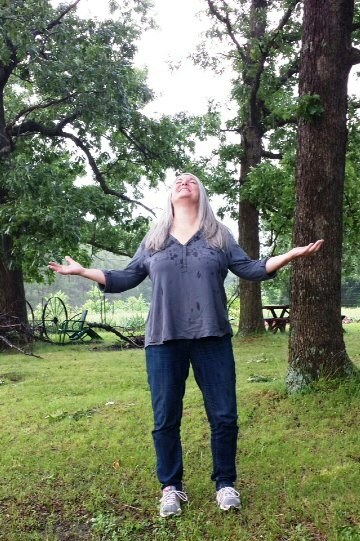 To quote Byron Katie again, “The only time we suffer is when we believe a thought that argues with what is.” Holding onto the thought that it shouldn’t be raining, would have invited suffering into my life. I didn’t want suffering. It should be raining today. How do I know? Because…it was.